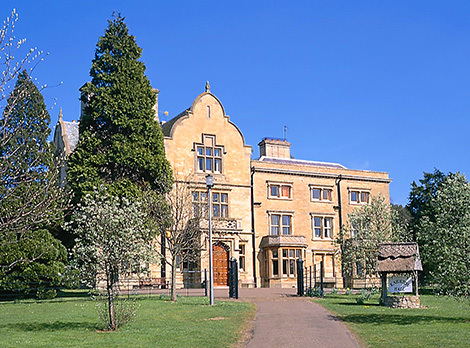 There will be three courses at Knuston Hall un Northamptonshire in 2016. There are two courses 'back to back' in February/March and a longer 'Summer School' in August. Knuston Hall provides full board accommodation for those who want it. However, if you live near you can attend as a day student. The aim of these courses is to help experienced students develop their own personal creative ideas. Please note: a basic knowledge of stitch is essential for all of my courses. 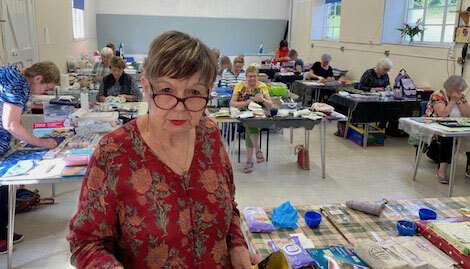 A workshop with Frances in the newly refurbished, well equipped, light and airy Practical Room at Knuston Hall. Knuston Hall is a fine seventeenth century country house situated in beautiful grounds between Irchester and Rushden in Northamptonshire. Under the control of the local authority, the management of the Hall run many courses and activities gaining a well deserved reputation for excellence coupled with good catering and remarkably friendly and caring staff. Using easily obtained and basic materials, make a series of three or four, small, books on a subject of your choice. Each book could be part of a collection of items (subjects) which could be divided into individual books. Then construct a clever protective wrap with pockets to keep them in. Make a decorative book with a transfer dyed, pelmet vilene cover. The cover is embellished with additional pieces of printed pelmet vilene, hand colouring, sealed with acrylic wax and finished with hand or machine stitch. Pages will be made from wall paper lining paper which will be coloured using Koh-I-Noor dye palette. Simple binding and fastening techniques will be explained and guidance given on how to fill the book. It would be a good idea to bring with you as a starting point, items of inspiration of your own choice. This could include: letters, photographs, scraps of fabric, interesting poetry or prose, books, your own drawings or ongoing textile work or even your own sketch book. Learn an easy way to construct a hardback book using simple techniques and materials. Combine pelmet vilene with board to make the cover. Then incorporate windows, flaps, found objects, material, threads, beads and embroidery to create a richly embellished book. Monday lunchtime - Friday lunchtime. Monday lunchtime - Wednesday lunchtime. Information can be found on www.knustonhall.org.uk or you can order a brochure from them by ringing 01604 362200.